A creative way to boost your brand awareness on social media. 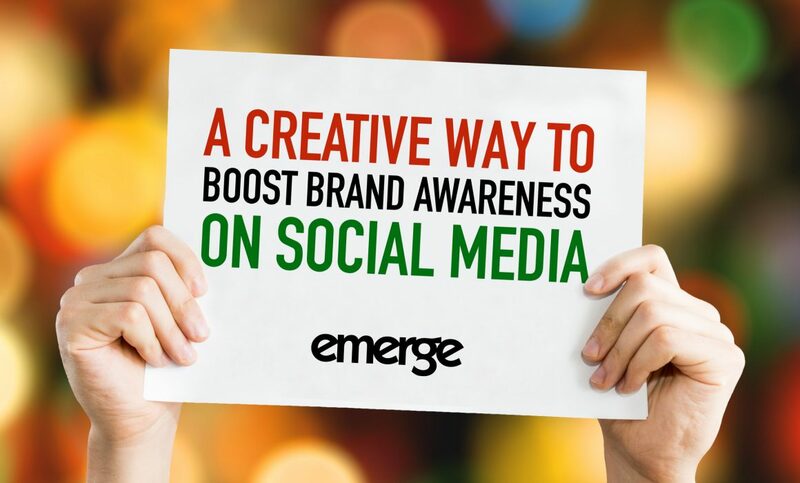 One of Emerge’s marketing strategies includes being proactive on social media platforms. 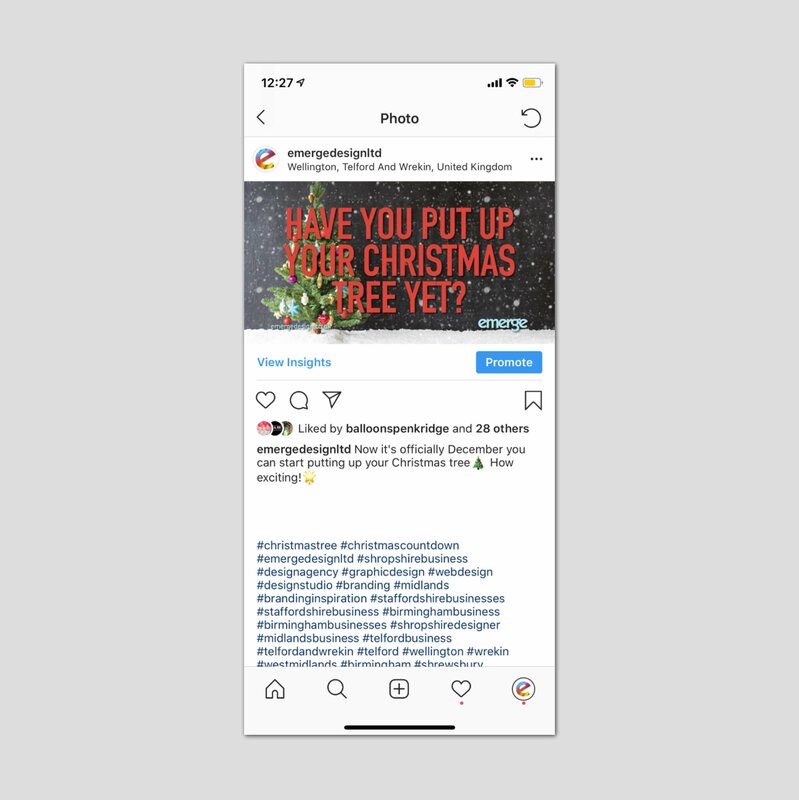 For example, in June last year we added an Instagram business page to our social channel portfolio, which now currently has over 1,200 followers. We have also increased our following and connections on our existing Twitter and LinkedIn accounts. We post on average 3-4 times a day. These posts include a variety of content, from industry news, self-promotion to interesting and relevant design facts. 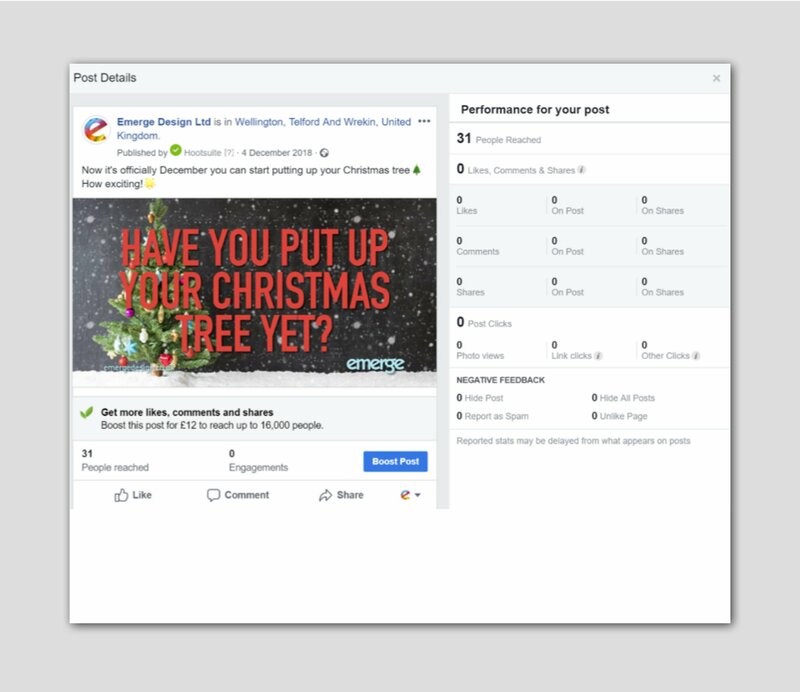 At the end of 2018, we wanted to launch a social campaign, something different from the usual posts. The festive period was the perfect opportunity to start the challenge. 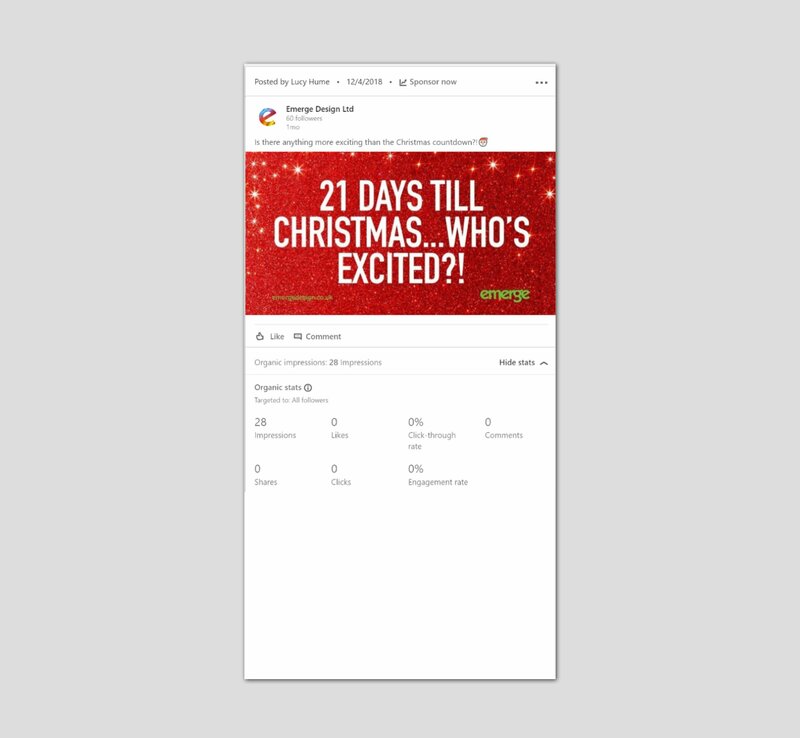 We knew that posting Christmas content persistently throughout the period would gain a lot of engagement. We posted more than usual focusing on creating a festive and joyful mood for our followers. 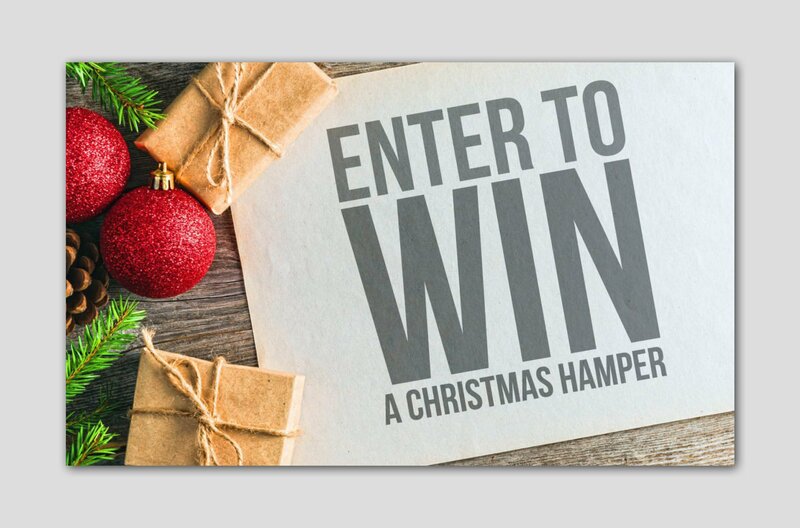 We wanted more results from social media, so after browsing the internet and creating a mind map, our idea was to create a christmas hamper competition campaign. A competition can build a strong following, awareness and engagement. If you’re lucky it could also create sales and customers. This is exactly what it has done for Emerge! The results were crazy, we did not expect the outcome. 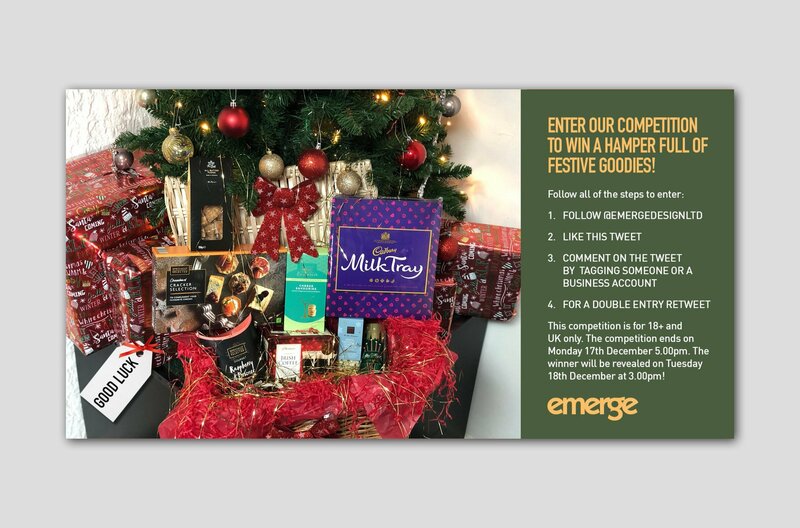 The christmas hamper competition was available to enter from Facebook, Instagram, Twitter, LinkedIn and we set up an online entry form on our website. For entries, the user had to follow steps shown below. 1.) Submit an email address using our online competition form. We felt it was also important to advise everyone that the snacks on offer may not be suitable for people with special dietary requirements and allergies. If that was the case other treats would have been arranged. We also added a GDPR compliant consent box on the online entry submission form. So we could analyse which type received the most results, we created a variety of posts using different image card designs and videos. This way you can contemplate upon what type of post your audience will prefer and what will benefit your social media strategy. Below are a selection of the posts. View the results from each social channel below. 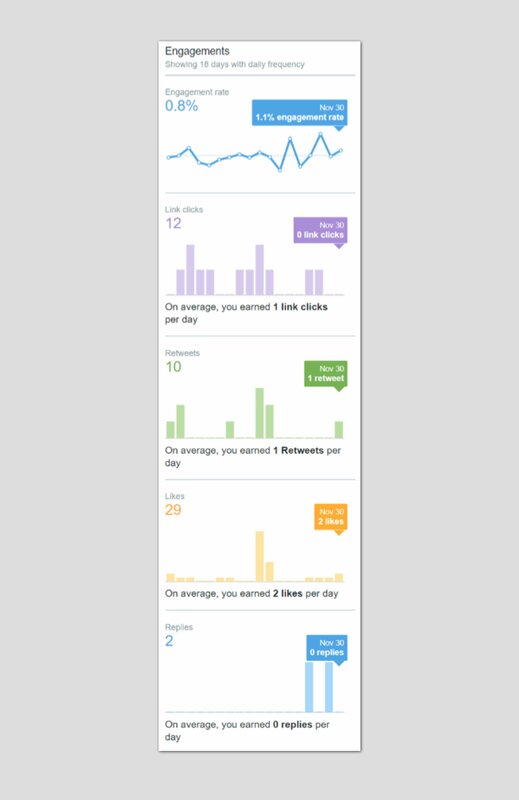 To boost the entries and awareness, we pinned the entry tweet on Twitter, and not surprisingly this specific tweet received the most impressions and total engagements from likes, retweets, and replies. 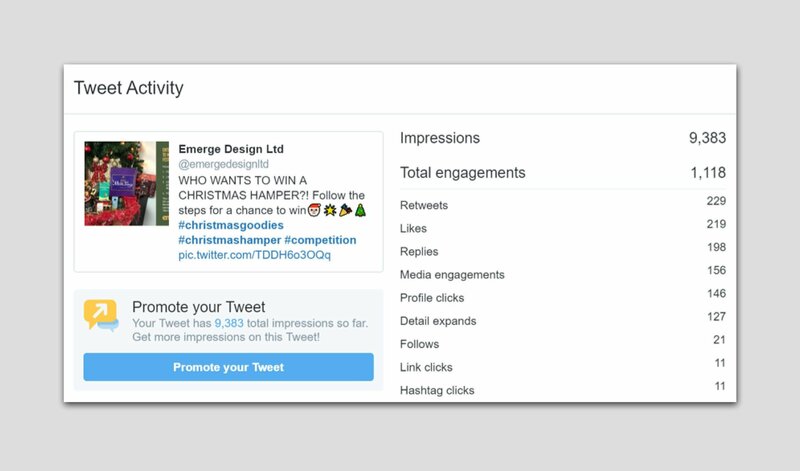 Without paying to advertise, the pinned tweet received an astonishing 9,361 impressions. Amazing right? This would be a perfect way to start up your Twitter account to build an audience. Below shows the difference between the engagement of an 18-day period of a normal date range compared to the 18-day period when the competition started and finished. The first screenshot shows a period of November 13th-30th and the second one is December 6th-18th. Twitter’s results were evidently the most successful followed by Instagram, then Facebook and finally LinkedIn. 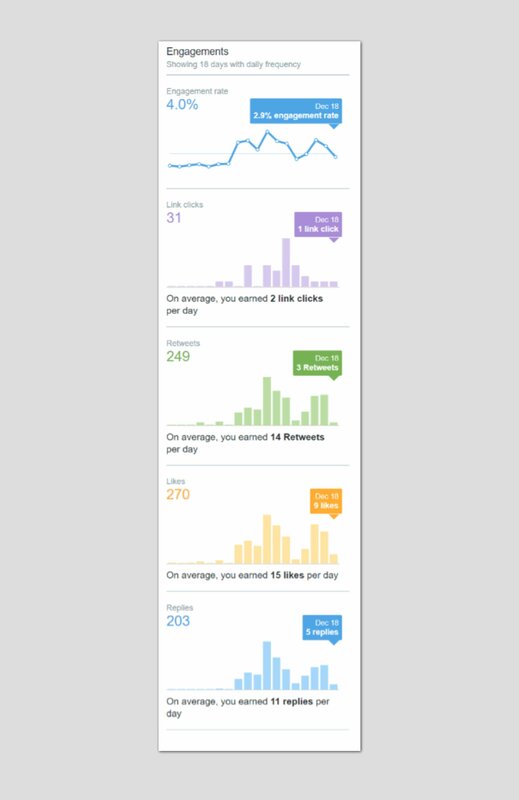 The pinned tweet counted 9,361 impressions. 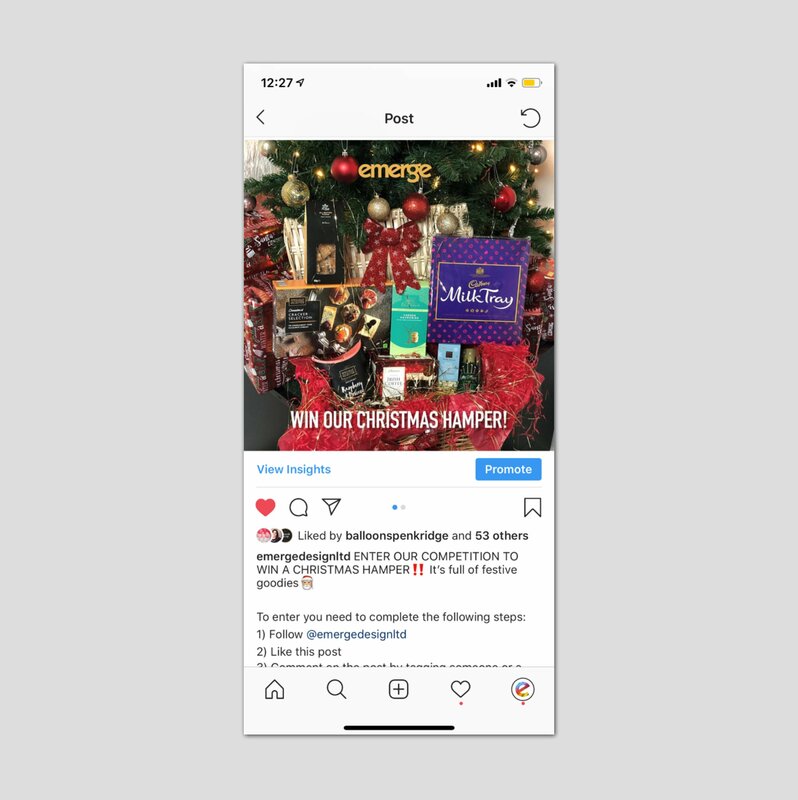 Here are two posts from Instagram, one festive post from the start of December and the first competition entry post. The same again for Facebook, this difference is crazy when you look at ‘people reached’. Again, showing one festive post from the start of December and the first competition entry post. 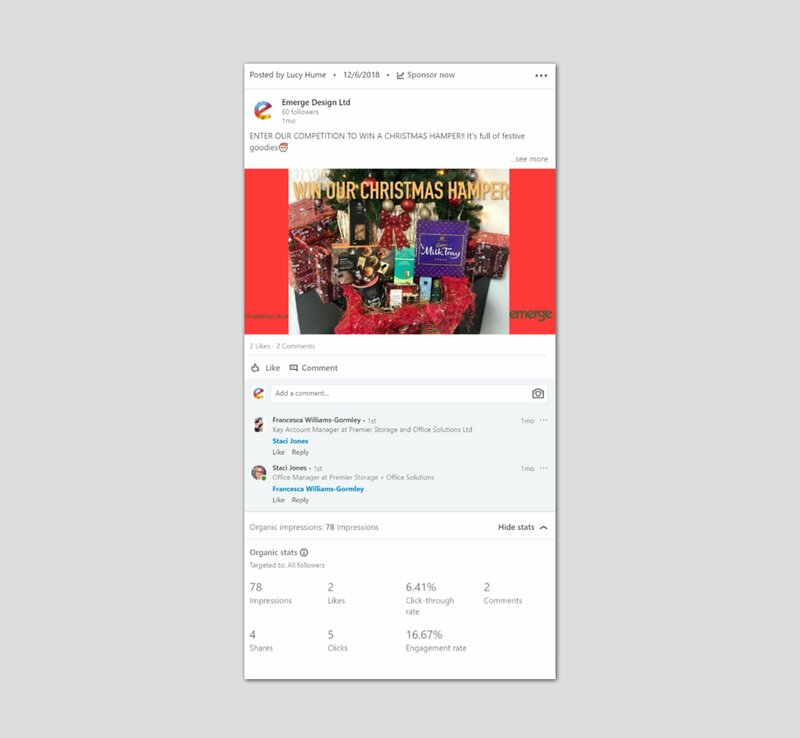 Even though LinkedIn’s results were not as good as the other 3 platforms, the difference between the results of a general Christmas post before the hamper was advertised and when it was, was a success. LinkedIn and Instagram had been posted the most with 6 times, in comparison to Facebook 3 times and Twitter 5 times. Yet, we suggest for more results, to pay to advertise your posts. But you may not feel like that is necessary. It would depend on your company size, budget and goal. We would recommend considering this for your LinkedIn company page, as this platform received the least results, yet was posted the most times. However, positively every platform received more engagement than usual on the posts. 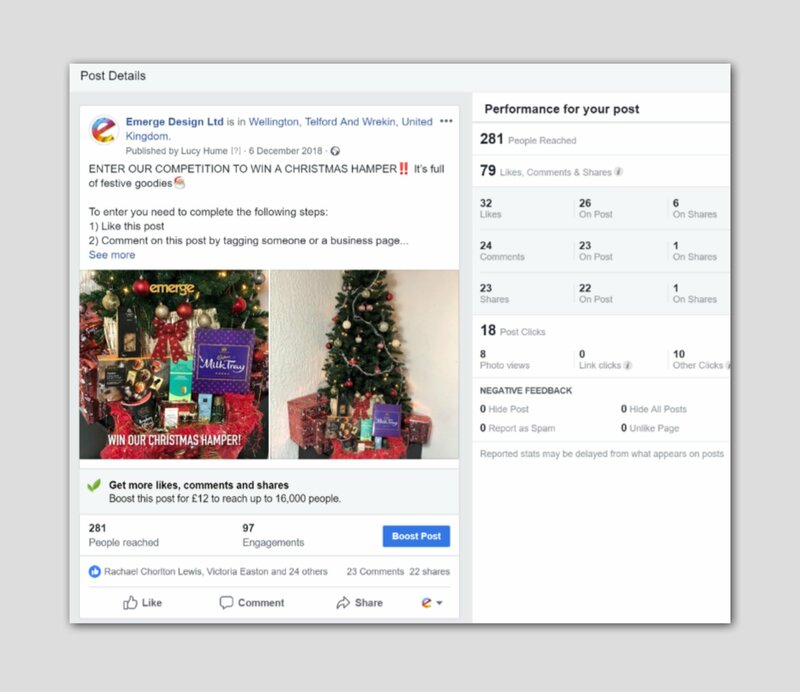 The most successful types of posts with the most engagements have been the picture of the hamper on its own and the post that contained the image and entry instructions. Below is a summary of the results. 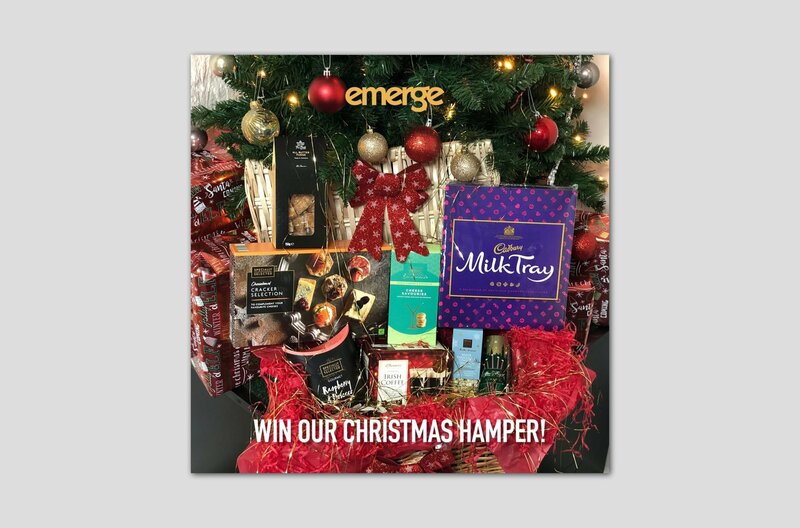 Overall, the Christmas hamper event was a success for us at Emerge. We certainly will be doing another competition but with different aims in mind. We have achieved the goal of brand awareness, yet next time we will focus on how we turn this into conversions for new client enquiries. We have received 2,029 page hits on our website, but none of these views have converted into new work enquiries. However, this wasn’t entirely our goal this time. We wanted to spread a joyful spirit and develop our brand awareness. This is what we accomplished! Why not create your own Easter competition, this could be by creating a hamper like we did? If you need help with us planning a competition for your social media, creating infographics or if you need a web page creating then get in contact with us. 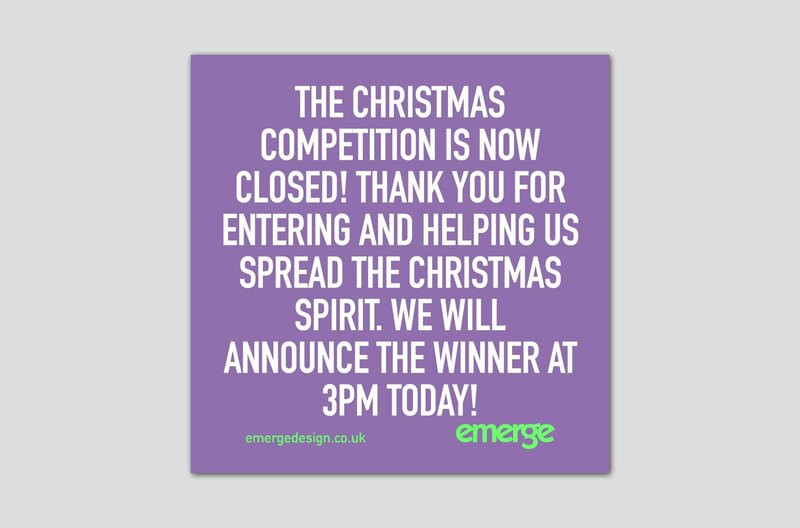 Email us on studios@emergedesign.co.uk or phone 01952 632750.